11:42 Style: Eat bugs to fend off the apocalypse! Do you enjoy stir fried crickets? Meal worm meatloaf? Chocolate covered ants? If so, you might just be doing the world a favor. 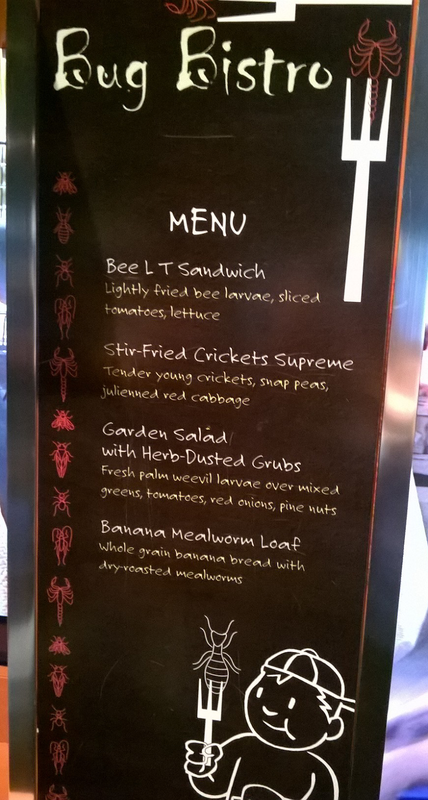 In my Ripley's @ OMSI post last week I briefly mentioned Ripley's Bug Cafe. The cafe was a food cart embedded with three screens which showed a play explaining why we should all eat bugs. It is a legitimate concept for conservation conscious humans to consider. MR Fish has tried bugs before and that has made me a bit curious. Can they really be all right? Wouldn't it be nasty if a leg got stuck in your teeth or something? Aren't they a bit weird texture wise? I think I'll hold off until they make something like an insect veggie burger. If I can't tell that it used to be a bug I might eat it lol. More likely than not we've all eaten bugs in our life times, on purpose or accidentally, but it still sounds so gross. We do everything we can to keep bugs from getting into our food, so why should we eat bugs? Apparently there are lots of reasons! It takes less space and water to raise bugs than livestock or plants. They are so easy to raise that they might become a future space food. They are a great source of protein, calcium and other vitamins and minerals. Many insects compulsively clean themselves. Yes, even cockroaches! Even the Romans ate beetle larvae and locusts. Worldwide there are far more people that eat bugs than those that don't. Since bugs are so easy to raise with limited resources, cultivating more bugs could feed a ton of people. The company Aspire USA has already begun raising insects in the US for just this purpose! They crawl around on the floor. They can potentially carry disease. Most of these negatives can be avoided if you cook bugs before eating them and purchase bugs from reputable sources. Keep in mind that many other food sources can carry diseases and bacteria as well. So I want to Eat Bugs, Where Should I Start? If you are adventurous enough to start eating insects straight up, Girl Meets Bug has an excellent list of sources for clean, edible bugs here. Daniella Martin, author of GMB also has recipes on her blog and even wrote a book entitled, Edible: An Adventure into the World of Eating Insects and the Last Great Hope to Save the Planet . I'm not sure if I'm ready to start eating bugs yet, but I really want to read this book! If you're interested in eating foods that contain insects, but don't look like insects you can check out Six Foods. They sell chips called "chirps" which contain cricket flour, but look like any other tasty whole grain chip. If you know of any other hidden insect foods, please let me know! P.S. - The link to the Edible book is an Amazon affiliates link, thank you for the support! The crickets I had did kind of stick in the back of my throat. They tasted good, though; sort of like popcorn. I would totally try the stuff on that menu. Those agave worms sound good, too. Haha.